The devices produced sufficient energy for use in household electronics, but did not ignite - even when punctured repeatedly with a nail. "In the past, if you wanted high energy, you would choose a non-aqueous lithium-ion battery, but you would have to compromise on safety. If you preferred safety, you could use an aqueous battery such as nickel/metal hydride, but you would have to settle for lower energy," said co-author Kang Xu, from the US Army Research Laboratory (ARL). "Now, we are showing that you can simultaneously have access to both high energy and high safety." However, at the time, the researchers were prevented from reaching higher voltages by something called "cathodic challenge". This occurs when one end of the battery (the anode) - made from graphite, or lithium metal - is degraded by the water-based electrolyte. 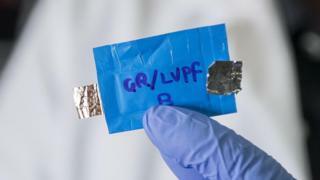 The gel polymer decomposes on the battery's first charge to form a stable layer called an "interphase". This interphase protects the anode from chemical reactions that stop it from working properly and allows the most desirable anode materials to be used in the battery.